Zare, M., Ordookhani, K., Emadi, A., Azarpanah, A. (2014). Relationship Between Soil Exchangeable Sodium Percentage and Soil Sodium Adsorption Ratio in Marvdasht Plain, Iran. International Journal of Advanced Biological and Biomedical Research, 2(12), 2934-2939. Mahdi Zare; Korosh Ordookhani; Abouzar Emadi; Arash Azarpanah. "Relationship Between Soil Exchangeable Sodium Percentage and Soil Sodium Adsorption Ratio in Marvdasht Plain, Iran". 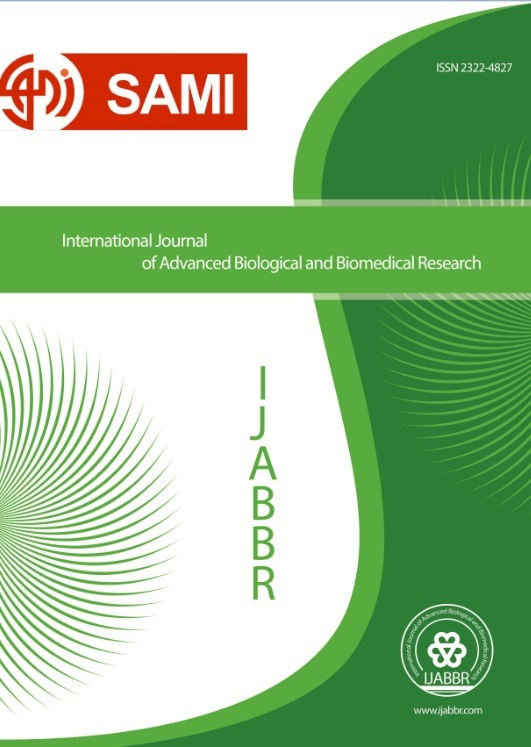 International Journal of Advanced Biological and Biomedical Research, 2, 12, 2014, 2934-2939. Zare, M., Ordookhani, K., Emadi, A., Azarpanah, A. (2014). 'Relationship Between Soil Exchangeable Sodium Percentage and Soil Sodium Adsorption Ratio in Marvdasht Plain, Iran', International Journal of Advanced Biological and Biomedical Research, 2(12), pp. 2934-2939. Zare, M., Ordookhani, K., Emadi, A., Azarpanah, A. Relationship Between Soil Exchangeable Sodium Percentage and Soil Sodium Adsorption Ratio in Marvdasht Plain, Iran. International Journal of Advanced Biological and Biomedical Research, 2014; 2(12): 2934-2939. Objective: Soil salinity is one of the major worldwide environmental constraints affecting agricultural production in arid and semiarid regions. Lack of proper management of water and soil resources lead to increase soil salinity and reduce soil fertility. On the other hand, it seems simple and cheap method of measuring soil salinity is necessary. The aim of this study was to determine the relationship between exchangeable sodium percentage (ESP) and sodium adsorption ratio (SAR) in some salt-affected soils of Marvdasht plain, Fars, Iran. Methods: To this purpose, fifty soil samples were randomly taken from surface (0-10 cm) and subsurface (10-20) cm from different fields of experimental site. Results: The statistical results of the study indicated that to predict soil ESP based on soil SAR the linear regression model ESP=0.941+1.119SAR with R2 =0.806 can be recommended.